CNN’s FAREED ZAKARIA GPS featured interviews with former U.S. Secretary of State Henry Kissinger (Nixon Administration) and Karl-Theodor Zu Guttenberg, the former German defense minister about recent developments between Russia and Ukraine and the international response to the ongoing crisis. FAREED ZAKARIA, HOST: Late last week, President Obama and German Chancellor Angela Merkel stood together in the White House Rose Garden to express their solidarity against Russia’s actions. Days later, Vladimir Putin softened his tone and seemed to be looking for a diplomatic solution to the Ukraine crisis. Will it happen and will Germany keep the pressure up? Joining me now are Henry Kissinger, the former U.S. secretary of State, and Karl-Theodor Zu Guttenberg, the former German defense minister. Henry, you were on this program during the — the Sochi Olympics. And you made two predictions. You said that, um, Putin was not going to like what was happening in Ukraine and the way in which Ukraine was trying to move to the West and move to the EU, and, b) that he wouldn’t do anything during the Olympics. Both proved exactly right, which is the day after the Sochi Olympics, Putin moved. Now, reading him — and you have met him more than any — any American, do you believe what you’re hearing come from him suggests that he is now looking for a diplomatic path? 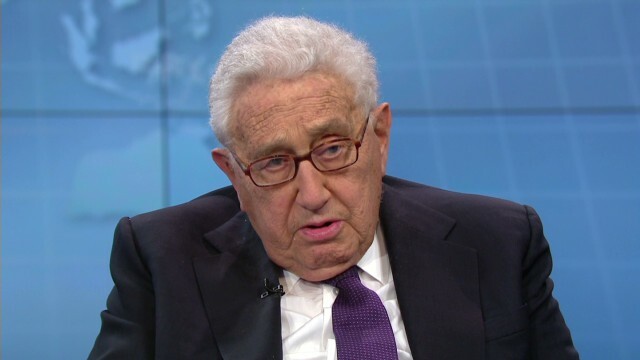 HENRY KISSINGER, FORMER SECRETARY OF STATE: Yes, I believe that he will… is looking for a diplomatic outcome. But one has to discuss what the outcome is. He doesn’t just want an outcome in the abstract. His concern, and of every Russian that I know, is to, uh, to — to have — to — they cannot look at Ukraine as an entirely foreign country. It’s part of their history. So membership of Ukraine in NATO is something that is extremely grating to them if it were to happen. And that — it’s the principle thing. Then he probably — almost certainly wants Ukraine as relatively weak as possible so that they’re not in a position to challenge him, because it’s a country of 45 million people. Those are his strategic objectives. ZAKARIA: You think he doesn’t want to annex Eastern Ukraine? KISSINGER: No. What he would like, I guess, is to have the Eastern Ukraine as a sort of autonomous region. But that’s not the key issue. The key issue seems to me to be this. KISSINGER: A Western strategic frontier 300 miles from Moscow is unacceptable to Russia. So the question is, can one create a kind of a… well, you can say a (inaudible) state or an even an area of cooperation in which Ukraine will be free to participate in European economic relationships, but does not join NATO? ZAKARIA: Now Merkel has been pretty strong in terms of supporting President Obama. She seems to be alone, though, in Germany in this regard. Uh, how do you read the German political situation? On the other hand, she is the leader around the globe that has had the most direct contact with Vladimir Putin during the last couple of weeks and months. And I think that’s a balance she has to keep for foreign policy. Talking about situation in Germany, she is facing quite some tough opposition. And you hear, also, some kind of a growing, I call it selective anti-Americanism in a group which is not famous for doing so. So that’s a new development and it makes it hard for her to — to deal with it. ZAKARIA: The — there’s an article by the editor of “Die Welt,” German — one of Germany’s big newspapers, saying, look, what we have to realize is the new Germany is not just the old West Germany of the Cold War, it’s this much larger entity. It includes parts of the east that have historically been close to Russia and have thought of themselves as part of a kind of bridge between the West and the East. Gerhard Schroder, the former chancellor, going to Putin’s birthday party. Uh, is — is this a new Germany that is going to try to play a kind of different role and — and Merkel is kind of the one person trying to tug it in the Atlantic direction? GUTTENBERG: So we have it already, since a couple of years, that the, um, that the discussion about finding an equilibrium or an equidistance between the West and the East falls on fruitful grounds in Germany. And, uh, the foreign — the former Chancellor Schroder is — is just one exponent for that very — for that — for that very notion, although it was quite ridiculous behavior he had shown out in the last couple of weeks, first of all, accusing the EU of aggressive behavior towards Russia and that the reaction, as such, was understandable. But it certainly is — is — it’s part of a Germany that tries to find a role within Europe, within the wider Europe that, uh, is somehow being redefined. ZAKARIA: Henry, we should still be working, you feel, to keep Russia, in a sense, integrated into the current global order? KISSINGER: I think, paradoxically, a — Russia is a country that has enormous internal problems. It has a declining demography. It has an inadequate industry. But it is in a piece of strategic real estate, from Petersburg to Vladivostok, which it is in everybody’s interests that it becomes part of an international system and not as an isolated island there. So, yes, I would — I think one has to interpret Putin not like a Hitler-like, as he has been, but as a Russian czar who is trying to achieve the maximum for his country. Usually, those methods are excessive and we are correct in standing up to it. And the — but we also have to know when the confrontation should end. ZAKARIA: Henry Kissinger, Karl Theodor, a pleasure to have you both on.